The Faculty of Mechanical Engineering is located in three different places in Prague. The largest one is in Dejvice: Technická 4, Praha 6 – Dejvice, 166 07. There is the dean's office, economic and administrative management, some of the service departments, most institutes, workshops and indoor labs. 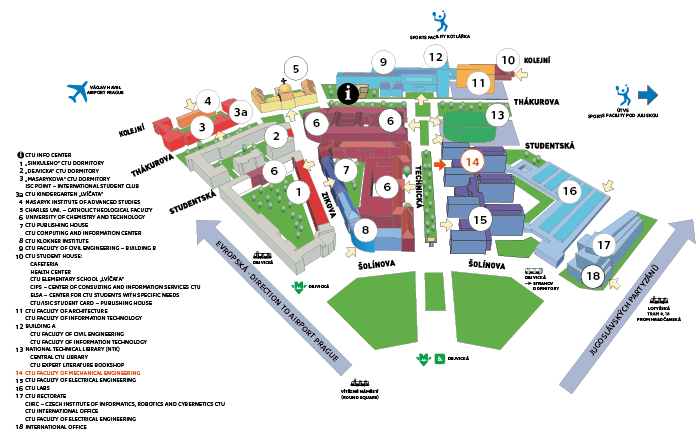 The second centre is located at the Charles Square: Karlovo náměstí 13, Praha 2 – Nové Město, 121 35. There is the Institute of Technical Mathematics, Department of Languages, part of the Institute of Mechanics, Biomechanics and Mechatronics, Department of Aerospace Engineering, Institute of Materials engineering and Institute of Management and Economics. Near this building in Karlovo Náměstí, you will find another premises in Horská street: Horská 3, Albertov Praha 2 – Nové Město, 128 03. There is the Department of Production Machinery and Equipment. Map for download is here.